Martha’s Vineyard. November 11, 2018. Marit and Aaron exchanged glances. “Whose turn?” Aaron demanded, scooping up a spoonful of chili. It was Marit’s own recipe, which she had tweaked to the point where the three of them could happily live on the stuff, it was that good. Alannah thumbed out text. “Mum and Far and Athair are upstairs.” She wrinkled her nose. “One of us has to get it and I got the door this morning,” Alannah added. “I got lunch,” Marit pointed out. “Fine, okay. I’ll do it.” Aaron shoved himself to his feet. He stalked through the kitchen to the formal, neat and tidy front foyer that no one ever used. He wrenched the dark oak door open. A Marine in full dress uniform stood on the tiled stoop. She had an arm in a black sling. In the other hand, she held an open letter. She looked up from the letter as Aaron opened the door and tucked her cap awkwardly under her wounded arm. There were bruises and healing cuts on her face. “Not in this house,” Aaron told her, straightening up to his full height. The woman was tall. She blinked. “Well…” She glanced at the letter. “Okay, here goes. I’m not wearing a red shirt.” She watched Aaron for his reaction and raised one brow. A special story marking a moment in history…lest we forget. 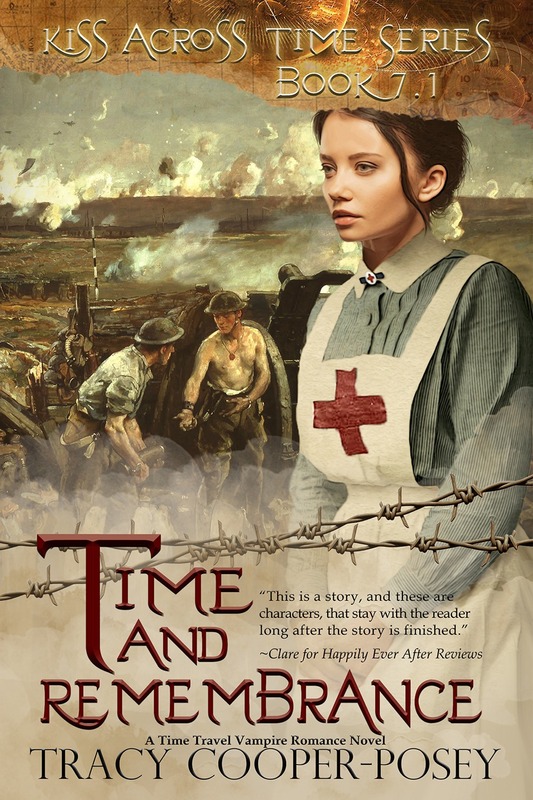 As a writer of historical novels, and a history nut of the first order, I knew I must mark the centennial of Armistice Day with a story. It would have to be part of the Kiss Across Time series, for every hero in that story has been impacted by war somewhere in their personal histories, and the settings of all other series I currently write wouldn’t let me put characters in France at the time of the Great War—not without some serious re-shaping of physics and story worlds. Once I had that key decision made, I turned to brushing up on my knowledge of the Great War, and researching trench warfare, the final days of the war, war casualties and more. The research was so harrowing and discomforting that I knew writing this story was the right thing to do. If more people knew and understood the horrors of World War One—the first “modern” war—then perhaps less wars would be waged for fear of invoking the same horrors. This is a Novella that complements a very wonderful series. It fit nicely into the series and we get to see our favorite characters again.Since it is a Novella I did not expect much but the story was packed with action that kept me riveted. Thanks for a great story Tracy. I can't wait to read the next books. This is another great read by Tracy. This series only keeps getting better. I’m looking forward to the next book in this series. A really great tribute for this special day. As usual Tracy knocks it out of the park with a story that is engaging from the very first page. A must read. What a wonderful story! Great characters and a thoroughly engrossing plot make this a great read. I highly recommend it to anyone who loves a terrific tale. Another great story by Tracy Cooper Posey. It follows along in the Kiss Across Time series but is a great read all by its self. More than that, it is an important reminder about the horrors of war, not just that experienced by soldiers but by civilians as well. Tracy Cooper-Posey has a gift for making history live enough to touch our minds and to become, just for a moment, real. I want MORE!!!! For a novella there's a lot going on. Can a young, but heroic young woman take big step and believe in the unbelievable? The author has given us a look showing us the horrors of war and the fantasy of travelling to the past to make sure a birth occurs that will save 8 million souls in the future. A story filled not with beauty and sensual love, but with the truth and ugliness of war. If we could all learn and remember these truths, just maybe those in power would not begin another. Once again this series just gets better and better. I can't wait to read the next one. Thank you, Tracy, for giving us another opportunity to honor and remember all who serve(d). As usual, you’ve incorporated new facts to learn, new perspectives to ponder and new adventures to enjoy. I love Taylor, Brody and Veris and look forward to traveling in time with them again and again.